As much as we offer, the surrounding area provides a wide range of additional opportunities, centering on the Catskill region. From outdoor recreation to local attractions, you are sure to find something to enhance your visit. Numerous trails and back roads offer hikers and bikers miles of wilderness and stunning scenery. The Catskill Park is filled with scenic waterways, and the Esopus Creek is a favorite for tubing, kayaking, and swimming. Neighboring towns offer unique shops, restaurants, and entertainment, including festivals, historic sites, and more. The historic towns of Windham, Durham, Hunter, and Catskill offer museums, parks, galleries, a lighthouse, and lots of places for kids to burn off their energy. There's so much to do in the Whip-O-Will neighborhood, we cant possibly list it all. Check out the Great Northern Catskills website for the most up-to-date info about everything thats going on. Located off of Rt. 32 in Catskill, this facility offers three attractions in one: horseback riding on scenic mountain trails (along with pony rides for the young ones), a zoological park with an assortment of exotic and farm animals (including a hands-on petting and feeding area), and a paintball park (with masks, suits, and guns provided). Located just 1.5 miles from Whip-O-Will, this roller rink has been in business since the 1940s. Open Friday - Saturday 7:00 - 10:00PM. Located on Mountain Avenue in Purling. Imagine flying through the air suspended from a cable by only a nylon strap, nearly 600 feet above the ground at over 50 miles per hour! Take in magnificent views of the Northern Catskills from a point where only the birds have gone before. Located about 10 miles from Whip-O-Will, Zoom Flume is New York’s #1 family waterpark. Many people drive from New York City (two hours away) for the tubing, lazy river, zipline and waterslides. Carved into the foothills of the Northern Catskills, this modest golfing lodge is part of the Blackhead Mountain Golf Resort, home to a challenging 18-hole championship course. The Catskill Golf Resort is now open to the public for the first time since 1928. Enjoy one of the Hudson Valley’s most beautiful and challenging 18 hole golf courses. Known for its beautiful golf course atop the Catskill Mountains, Windham Country Club is an 18-hole public golf course with a private club atmosphere. Located in the heart of Windham, NY, the course is scenic and challenging with beautiful greens and fairways that follow the Batavia Kill and spectacular views of the Great Northern Catskills. Located on Rt. 23 in East Windham. On a clear day, the panoramic view from this location encompasses the White Mountains of VT, the Berkshire Mountains of MA, the Helderberg Mountains of NY and the CT Valley. Located on Route 23A in Haines Falls, Kaaterskill Falls are the highest cascading waterfalls in New York State. Marked scenic hiking trails are available, with spectacular views of the Hudson Valley. To get an extensive list of hikes in our area, check out www.greatnortherncatskills.com or you can download an app right to your phone! This is a complex of Dutch Colonial dwellings and 19th century barns located on County Rt. 42, in Coxsackie. The oldest house is from 1663, and there is a 13-sided barn with a collection of horse-drawn vehicles. The spectacular home and studio of Hudson River School painter Frederic Edwin Church. It is a designated National Historic Landmark and one of the most visited sites in the state. Located right across the Rip Van Winkle Bridge in Hudson. Come see where American art was born and walk in the footsteps of the Hudson River School’s foremost landscape painter. Located at 218 Spring Street, at the western entrance of the Rip Van Winkle Bridge in Catskill. 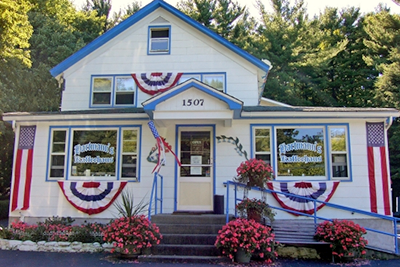 Cooperstown has become synonymous with baseball lore. Thats because since 1939, the village has been home to the National Baseball Hall of Fame and Museum, the most iconic sports shrine in the game. The red-brick building on Main Street honors and commemorates over 300 of baseballs greats, including Babe Ruth, Willie Mays and Joe Torre. Your journey winds through limestone corridors, cavernous galleries, under massive boulders, to a subterranean riverbed carved over countless millennia. Deep in the cave, solid rock appears fluid: creating strange formations, flowing sheets and dripping stalactites. About an hour from Whip-O-Will. At Bethel Woods from June 13-16, 2019. About an hour from Whip-O-Will Campsites. At Hunter Mountain from June 7-9, 2019. A who’s who of bluegrass in the Catskill Mountains happens July 18-21, 2019. Casual pub fare and take-out. We recommend the fried chicken! Open seven days a week for lunch and dinner. Route 23, Catskill. Click here for reviews. The Bavarian Manor is noted for its German fare, with an impressive restaurant that is a teaching kitchen for both the Culinary Arts of America and the California Culinary Institute. The inn is about a mile from the campground on County Rd. 24 (Mountain Avenue). Click here for reviews. Come for the food, stay for the incredible view! Located on Rt. 23 in East Windham. Just 10 minutes from WOW. Click here for reviews. For a good breakfast or hearty lunch and wonderful pastries, try Hartmann’s Kaffeehaus, about two miles from the campground on County Road 31. Click here for reviews. Offering breakfast and lunch, Tuesday through Sunday, the Log Cabin is at the junction of Mountain Avenue and County Road 39. Click here for reviews. With its cozy European atmosphere, dining at Maassmann’s provides the feeling and ambiance of having a meal in a native German home. Located just two miles from Whip-O-Will at the Blackhead Mountain Country Club. Click here for reviews.